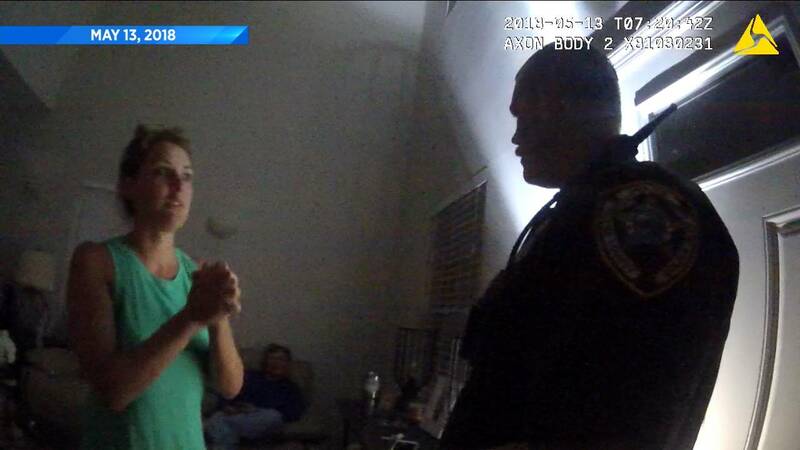 BRUNSWICK, Ga. - The Glynn County Police Department on Friday released body camera video from the night Katie Kettles-Sasser called police on her estranged husband, former Glynn County Police Lt. Robert "Corey" Sasser. The bodycam footage shows alarming moments between the couple. According to the Georgia Bureau of Investigation, Sasser, 41, died of a self-inflicted gunshot wound during a SWAT standoff at his home hours after Kettles-Sasser, 34, and her male friend, 39-year-old Johnny Edward Hall Jr., were shot and killed June 28 at Hall's home in neighboring McIntosh County during a confrontation with Sasser that involved an exchange of gunfire. Nearly two months earlier, on the evening of May 13, Glynn County police arrived at Kettles-Sasser's home after she called 911 on her estranged husband. Hall was also at her home that night. 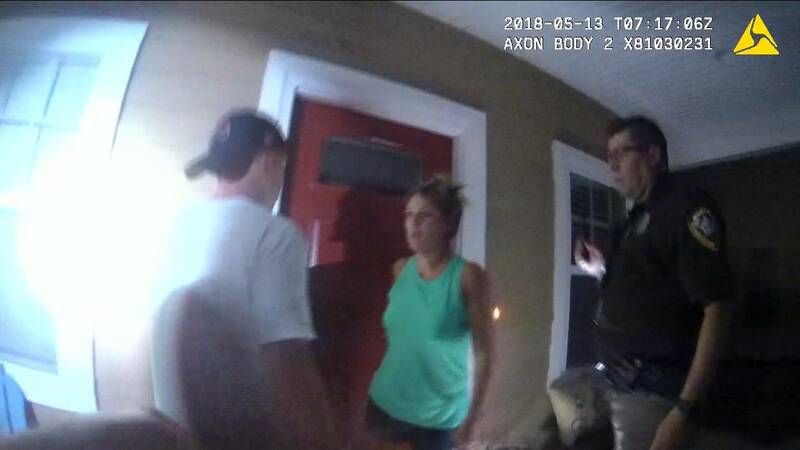 In the bodycam video, at least three officers can be seen at the home, along with Sasser, who is wearing a white shirt, and Kettles-Sasser, who is wearing a green shirt. Seconds later, Sasser can be seen trying to get inside the home before officers stop him and walk him away from the house. As he steps away, Sasser says, "You know what's gonna happen." Kettles-Sasser continues to explain Sasser's behavior is why she and Hall called police. Sasser hears her say "we" and then says, "We? We?" "I was here by myself," Kettles-Sasser replies. An officer then goes inside to talk with Kettles-Sasser and Hall. "What is going on?" the officer asks. As Hall sits on the couch, Kettles-Sasser says, "I'm sitting here. We are watching a movie. He comes and literally is kicking down the door. So we called police." The officer then says Sasser is asking for keys to a Tahoe. Kettles-Sasser instantly gives up the keys. Kettles-Sasser and Hall also tell police that Sasser threatened to kill them. "I feel threatened," Hall can be heard saying in the footage. "He said he was going to kill everybody in here." "He said that tonight?" the officer asks. Kettles-Sasser replies, "Yes, he did. He threatened us. He's upset. Just get him off my property." Later in the video, Sasser denies the accusation. Officer: "Were you kicking on the door?" Sasser: "No. I knocked on the door ... I didn't break nothing. I knocked on the door." Officer: "Did you make any threats?" Sasser: "No. I didn't make any threats." Sasser was arrested on charges of simple battery and criminal trespassing stemming from the May 13 incident. 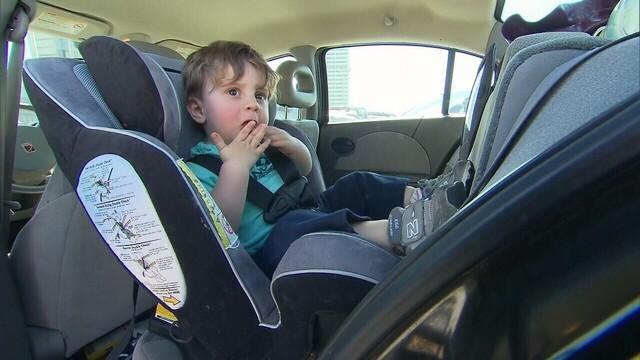 He was placed on administrative leave without pay pending an investigation. Sasser had been free on bond after the May 13 incident but was arrested again after another police standoff in the woods in Glynn County. In that case, he was charged with possession of a gun. Kettles-Sasser's memorial service will be held 2 p.m. Saturday at Edo Miller and Sons Funeral Home.